A nail-studded bat smashes a TV showing glitched-out anime in the opening of every episode of the new, surreal anime Pop Team Epic. The show tells you straight-up what it’s about: burning anime tropes to the ground. And in the process of destroying everything anime fans know and love, it manages to become something wholly fresh. Pop Team Epic is a series of skits starring two cat-faced girls, Popuko and Pipimi. Each skit lasts about a minute and, in the span of one episode, can reference up to ten or so video games, television shows or cultural tropes. There’s a skit where Popuko, running to school late with toast in her mouth, collides with Pipimi on the street—a scene recognizable from dozens of anime dramas. There’s a Skyrim reference in which Popuko wakes up in a wooden cart and sees Pipimi, who asks, “Are you awake now?” There’s a skit without the protagonists that appears to be a convincing pop idol anime, complete with its own intro. Originally a four-panel webcomic, Pop Team Epic received a big-budget anime treatment this winter. Styles it samples: stop-motion with felted toys, CGI, IRL camerawork and a mutant, drawn anime. Watching it, I questioned constantly, “Who the hell green-lighted this?” and, also “Why wasn’t this made sooner?” Pop Team Epic is flush with dumb cultural references it rarely bothers to comment on. For me, that’s where its charm lies. When those references—especially to anime and games—are recontextualized in Pop Team Epic’s surreal, genero-animeland, it’s easy to see how generic the media they come from are. Skyrim’s opening is so bland that it could exist anywhere. The fact that the trope-filled intro for Pop Team Epic’s fake pop idol anime could be real is both depressing and telling. It’s a meta-commentary on the show’s inspirations and the culture that surrounds them. 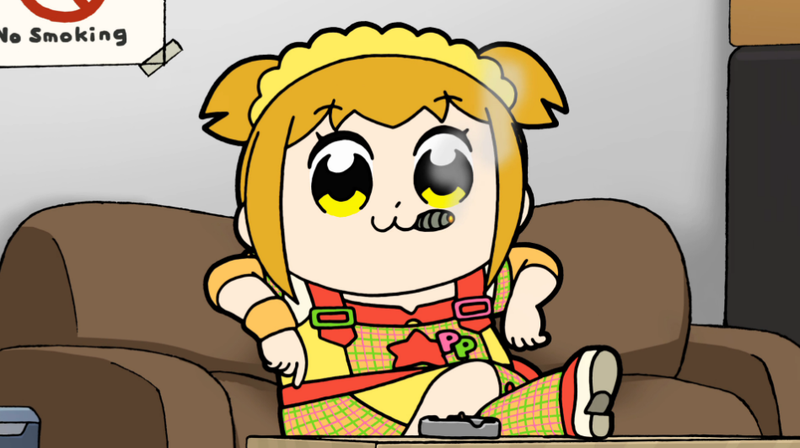 Watching Pop Team Epic is a release. Surrounding it on streaming service Crunchyroll’s winter anime offerings is Overlord, with a plot reskinning that of 2012 anime Sword Art Online, and the trope salad anime Ms. Koizumi Loves Ramen Noodles, about a mysterious transfer student who—well, you know. Anime is laden down by its past successes, which, every season, new shows attempt to realize again through predictable cliches. I never know what’s coming next in an episode of Pop Team Epic. Although it’s pieced together from tropes, nothing about it falls into any of its own.